The recent developments surrounding Riga municipal company Rīgas satiksme are no coincidence – rather a logical unravelling of events. Riga City Council chairman Nils Ušakovs should take full responsibility for it, said Latvian Interior Affairs Minister Sandis Ģirģens in an interview to LNT programme 900 seconds. He based his assumptions on the fact that RS has been generously subsidized by Riga City Council for years. On top of that, the minister said it was never clear where this money went. He adds there is a lot to evaluate and investigate in the criminal process on RS procurements. When asked if Ušakovs should step down after all this, the minister was ambiguous in his response, as he believes only the court in Latvia is authorized to declare someone guilty. Still, he does say Ušakovs should take responsibility should step down purely from an ethical standpoint. «Unfortunately, all is not well in Latvia when it comes to compliance with ethics in politics,» adds the minister. 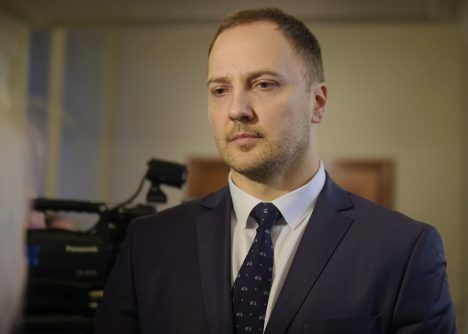 As it is known, Corruption Prevention and Combating Bureau performed searches in the office and home of Riga City Council chairman Nils Ušakovs on 30 January. In its statement, KNAB confirmed a criminal process was launched in November 2018 in relation to procurements organized by Rīgas satiksme. In relation to this criminal case, KNAB performed searches at several addresses. Ušakovs later confirmed to journalists that KNAB officers did perform searches in his office and home on 30 January. Ušakovs’ wife and office head Iveta Strautiņa-Ušakova said only her husband’s name was mentioned on the order regarding the search. The politician refused to discuss the case in detail, stressing that he has signed a non-disclosure agreement. Ušakovs did not say as part of which criminal process searches were performed. The politician also added that he has been given no status in any criminal case, nor has he been asked to come testify. Nevertheless, he is certain he will have to meet with KNAB officers at some point. Following the criminal process regarding three of Rīgas satiksme’s procurements, the entire management board of the company stepped down. A temporary management has been appointed. Riga City Council Vice-Chairman Andris Ameriks also stepped down after information was publicly reported. As it is known, KNAB commenced a criminal process in relation to three procurements organized by Rīgas satiksme – the 2016 low-floor tram procurement (EUR 62,597,477), the 2013 trolleybus procurements (EUR 131,646,135), as well as the 2013 bus procurement (EUR 75,808,297). The criminal process revolves around bribery and money laundering activities. Riga City Vidzeme Suburb Court applied an arrest to six out of seven suspects. Honour to Serve Riga long-term member Aleksandrs Krjačeks was later released from custody after eight days. Škoda Transportation official Vladislavs Kozaks, RS Infrastructure Maintenance and Development Department Director Igors Volkinšteins, former RS chairman Leons Bemhens, businessmen Māris Martinsons and Edgars Teterovskis remain under arrest. According to KNAB, the criminal process was launched in regards to criminal activities performed by representatives of Czech and Polish companies in cooperation with Riga City Council and Rīgas satiksme officials and their associates. All the people involved in the criminal case performed money laundering and provided influx of funds through fully functional and fictive companies, thereby providing bribes for Riga City Council and Rīgas satiksme officials in the three procurements. Nekā personīga reported that for every supplied trolleybus, bus and tram, 5-7% of bribes were paid. The total value of three procurements exceeds EUR 270 million, which means bribes account for 13.5 – 20 million euros.